Benovia Winery and Kutch Wines are this year’s California “Wineries of the Year.” The two wineries present quite a contrast. Benovia has a more glamorous winemaking facility and hospitality center in Santa Rosa, while Kutch is housed in a more modest warehouse setting in Sonoma. Benovia’s winemaker, Michael Sullivan, is a veteran in the Russian River Valley, while Jamie Kutch is a relative newcomer in comparison. Benovia produces Pinot Noir and Chardonnay from estate vineyards almost exclusively, while Kutch’s wines come only from sourced grapes. 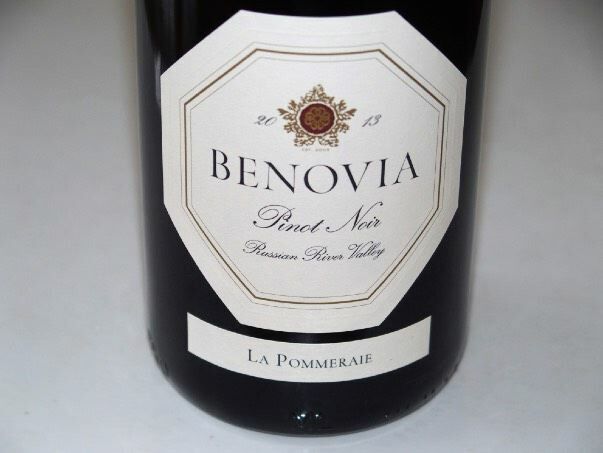 Benovia’s Pinot Noirs are made using a typical Russian River Valley approach using largely de-stemmed grapes and aging in about one-third new oak barrels. Stylistically, the wines show luscious fruit flavors beautifully balanced with structured tannins and modest acidity. Kutch vineyard sites are much cooler in general and the grapes are picked earlier. The wines are fermented 100% whole cluster, and aged in very modest new oak. Stylistically the resultant wines are lower in alcohol and higher in acidity with an emphasis on delicacy and balance. Kutch Chardonnay is more lean and acid-driven, while Benovia’s Chardonnays are more richly fruited with more barrel input. The two styles of Pinot Noir and Chardonnay are far apart, but both are equally alluring. Walter Scott Wines is the 2017 Oregon “Winery of the Year.” Located in the Eola-Amity Hills region of the Willamette Valley, owners Ken Pahlow and Erica Landon specialize in Pinot Noir and Chardonnay vinified with grapes sourced from multiple premium vineyards primarily located in the Eola-Amity Hills AVA. After only nine vintages, Walter Scott has risen to the top tier of Oregon wineries, primarily due to the couple’s talents and the special vineyard sources that give their wines their dazzling character. Wine Purchases: Wines are sold through a mailing list, the winery’s website and the tasting room. $40-$75. Wines: Russian River Valley, Sonoma Coast and Sonoma County Pinot Noir, Russian River Valley and Sonoma Coast Chardonnay, Russian River Valley Blanc De Blancs, Sonoma County Zinfandel and Sonoma Mountain Grenache. Annual production about 5,000 cases. This winery dates to 2003 when Joe Anderson and spouse Mary Dewane bought a 55-acre ranch west of Healdsburg just outside the Russian River Valley AVA that included included old vine Pinot Noir and Zinfandel planted on the property’s Cohn Vineyard. The property also included a home that allowed Joe and Mary, who lived in Arizona, to spend time in Sonoma County and pursue their winery aspirations. 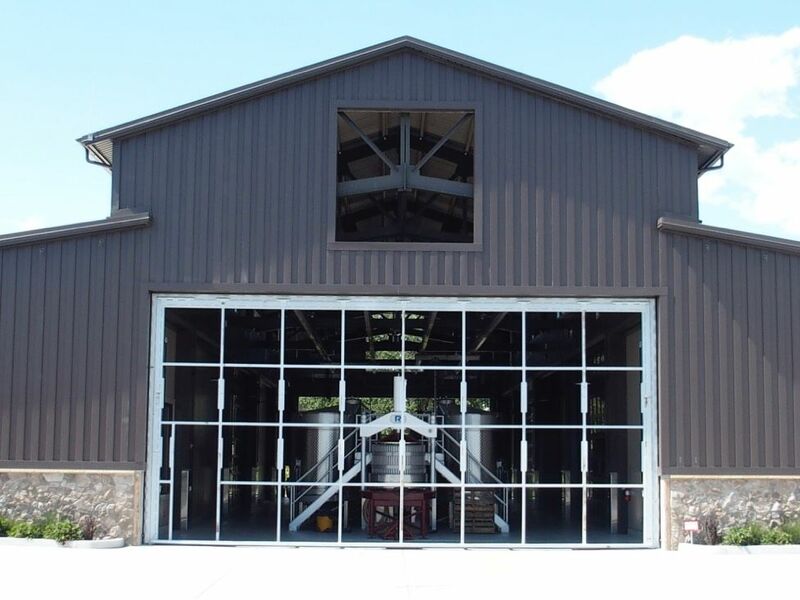 In 2005, the couple purchased the Hartman Road Vineyards and Winery from Cecil DeLoach. The 18-acre ranch, located in the Laguna de Santa Rosa sub region of the Russian River Valley, had 13.5 acres of Pinot Noir and a dated winery. Eventually, a 40-acre horse ranch parcel adjacent the winery property was acquired increasing the property to 58 acres. The original 13.4-acre estate vineyard was expanded to almost 42 acres and renamed Martaella Vineyard. This vineyard includes nine clones and heirloom selections of Pinot Noir and four clones of Chardonnay, all planted in a high density configuration of between 2000 and 2722 vines per acre. A 16-acre site near Freestone named Tilton Hill Vineyard, has been planted with 12 acres of Pinot Noir. Again, this is a high density planting established in 2009 with Dijon selections of Pinot Noir. Today, Benovia Winery has 71 acres of Pinot Noir, Chardonnay and Zinfandel vines in three distinctive locations across the Russian River Valley AVA, the Sonoma Coast AVA and the Sonoma County AVA. The name, Benovia, is a merger of the first names of Mary Dewane’s father, Ben, and Joe Anderson’s father, Novian. The property’s estate Martaella Vineyard was named for the mothers, Martha (Joe’s) and Eleanor (Mary’s). Tasting: Available to mailing list customers who have made a previous purchase from the mailing list. 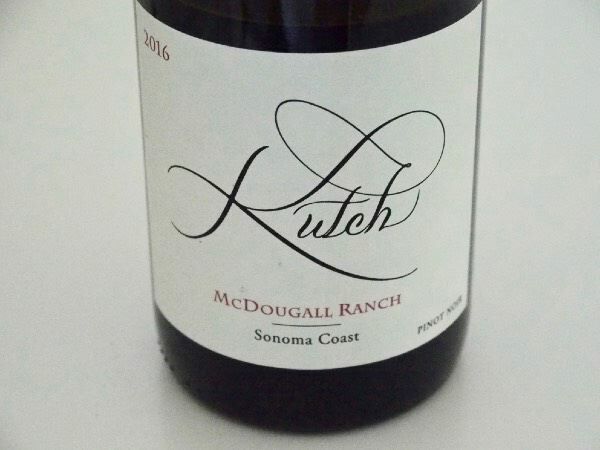 Email tastings@kutchwines.com well in advance. Weekdays only. A limited number of appointments are available for those who don’t have a previous purchase ($30 per person). Wine purchases: Offered twice a year to mailing list members only by allocation. Prices range from $39-$62. Wines: Offered twice a year to mailing list members only. Sonoma Coast Rosé of Pinot Noir, Sonoma Coast Pinot Noir, Bohan Vineyard Sonoma Coast Pinot Noir, Falstaff Vineyard Sonoma Coast Pinot Noir, McDougall Ranch Sonoma Coast Pinot Noir, and Signal Ridge Mendocino Ridge Pinot Noir. Very limited amount of Santa Cruz Mountains Chardonnay has been produced. Annual production 2,500 cases. I have profiled Jamie extensively over the past twelve years since I first met him. Jamie’s interest in Pinot Noir developed while he was working as a stock trader at Merrill Lynch in New York. He has admitted that part of his interest was fueled by reading the PinotFile. Upon the urgings of other young winemakers in California, including Andrew Vingiello (A.P.Vin), Brian Loring (Loring Wine Company) and Michael Browne (Kosta Browne), Jamie quit his job, talked his wife-to-be, Kristen, to move west with him, and began learning winemaking under the tutelage of Michael Browne. I first met Jamie when he was working for Michael while Michael was making wine at Freeman Winery in Sebastopol in the early 2000s. 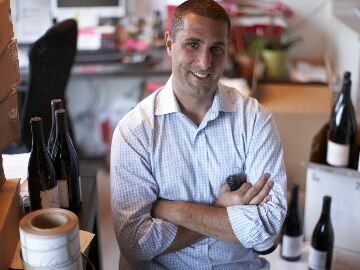 Jamie did not follow the path of Kosta Browne Pinot Noir stylistically after his first two vintages. 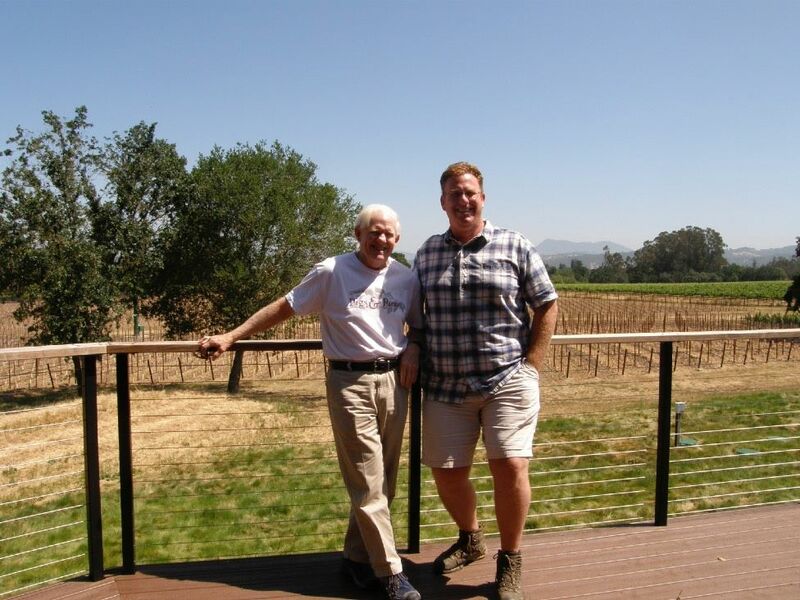 He developed his own style through tasting many older vintages of top-shelf California Pinot Noir looking to discover their desirable wine traits such as balance and age ability. Travels to Burgundy allowed him to learn more about stem inclusion and time spent with accomplished California winemakers and growers fueled his passion. His talent as a thinker and innovator led him to push the envelope successfully. He has become respected by wine cognoscenti for the individuality of his wines and his accomplishments in a relatively short period of time. Jamie’s first commercial vintage was 2005, the same as for Benovia Winery. Since then, he has become a strong proponent of whole cluster fermentation. Inclusion of whole clusters in fermentation adds an extra dimension to the structure, texture, sensuality, and aromatic and flavor profile of Pinot Noir. That said, there are a number of potential pitfalls to this technique such as green aromas and flavors, so appropriate vineyard sites must be chosen carefully vintage vagaries taken into account, and vinification protocols adapted accordingly. Jamie began extensive whole cluster trials in 2009 and was cautious at first, but he found that it was the wines he produced with 100% whole cluster fermentation that he liked the best. By 2012, he was all in so to speak, vinifying all of his wines with 100% stem inclusion. In the winery, after the grapes are carefully sorted, Jamie puts the whole clusters in open-top fermenters, initiates fermentation with wild yeasts, punches down with his feet, then basket presses the must into French oak barrels where natural malolactic fermentation ensues. The wines are aged on the lees for about 10 months, and left alone until bottled unfined and unfiltered. Tasting: Cellar tasting by appointment only hosted personally by Ken or Erica. Schedule: info@walterscottwines.com. Closed until Spring Release in early March. Wine purchase: The wines are sold primarily through a mailing list. A limited selection of wines are available on the website. Price range $28-$85. Wines (2015): La Combe Verte Willamette Valley Pinot Noir, Cuvée Ruth Eola-Amity Hills Pinot Noir, Sojourner Vineyard Eola-Amity Hills Pinot Noir, Freedom Hill Willamette Valley Pinot Noir, Temperance Hill Eola-Amity Hills Pinot Noir, Clos Des Oiseaux Vineyard Eola-Amity Hills Pinot Noir, Dubai Vineyard Eola-Amity Hills Pinot Noir, Seven Springs Vineyard Eola-Amity Hills Pinot Noir, Los Muertos Eola-Amity Hills Pinot Noir. La Combe Verte Chardonnay, Cuvée Anne Willamette Valley Chardonnay, Freedom Hill Vineyard Chardonnay, X Novo Vineyard Eola-Amity Hills Chardonnay. Annual production 4,500 cases (2015). In 2016, Chardonnay from Bunker Hill Vineyard will be added. I had my first up close meeting with Ken Pahlow and Erica Landon this past July before the International Pinot Noir Celebration (IPNC) when I tasted through all of their 2016 Pinot Noir and Chardonnays resting in barrels. The winemaking facility is very modest but that is of little importance when the wines are dazzling. I believe Ken and Erica should adopt the tagline, “We have the grapes!” since all of their wines are sourced from very special Willamette Valley vineyards. The couple have been involved in the Oregon wine business for more than twenty years and the contacts and friendships established over this time have enabled them to source fruit from a very impressive lineup of prestigious vineyards. All great wine starts with great grapes. Ken’s past winemaking experience includes stints at St. Innocent Winery (14 years), Patricia Green Cellars (where he first began producing the Walter Scott wines) and Evening Land Vineyards where he worked alongside Burgundian winemaker Dominique Lafon. Erica is a sommelier who has taught for the Wine & Spirits Education Trust and International Sommelier Guild, and managed wine programs at prestigious restaurants including Timberline Lodge, Ponzi Family’s Dundee Bistro, Ten 01, and a number of Bruce Carey restaurants in Portland. In 2014, both Ken and Erica left their additional jobs to focus entirely on Walter Scott. Andy and Sue Steinman have provided legal counsel (she is an attorney focused on wineries) and Andy business experience, as well as financial backing for Walter Scott since 2012. Many of you know the Steinmans who attend the IPNC faithfully every year. The IPNC was where I first met them many years ago, and they have kindly shared special Pinot Noir wines from their extensive cellar at the Salmon Bake ever since. The name, Walter Scott, honors Walter, Ken’s grandfather who was a flight engineer for TWA, and Ken’s nephew, Scott, whose time was short but impressed with his fearlessness. 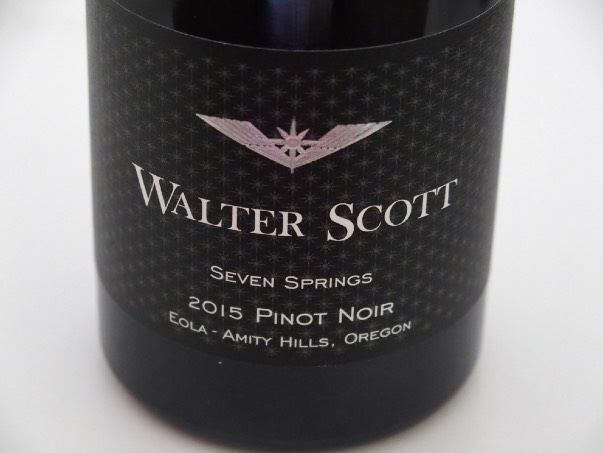 Walter Scott was launched in 2008 with the modest production of 25 cases of Pinot Noir and 135 cases of a non-vintage white grape blend. The first commercial vintage followed in 2009, a total of 650 cases of La Combe Verte Pinot Noir that was a tribute to the team at Patricia Green Cellars where the wine was produced by Ken. 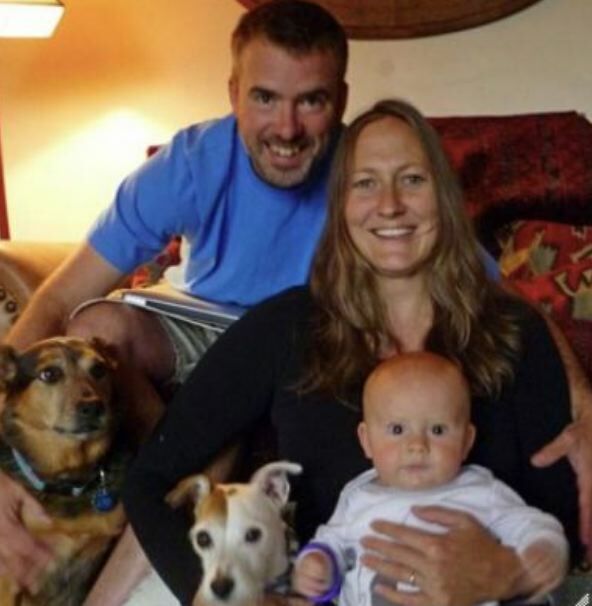 In 2012, a winery space in the Eola-Amity Hills located adjacent to Justice Vineyard was leased to Ken and Erica by the Casteel family of Bethel Heights Vineyards. The same year, fruit was offered from the renowned Freedom Hill and Temperance Hill vineyards. 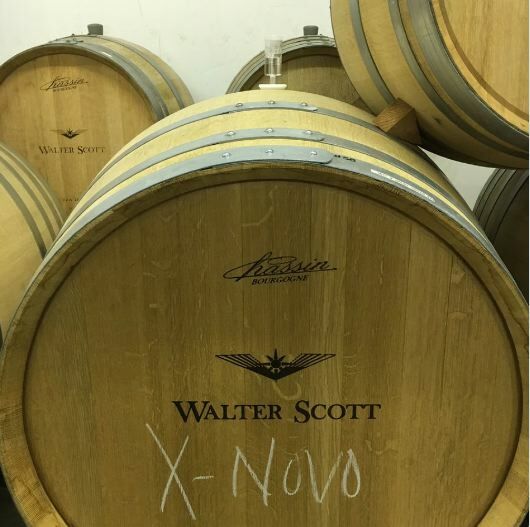 In 2013, X Novo and Sojourner vineyards were added and in the following year, Seven Springs Vineyard became a fruit source. Critical acclaim about Walter Scott wines quickly rolled in from many prominent wine publications. Sometimes, a winery’s esteem is reflected in the quality of the appellation wines, not just the vineyard-designated wines. At Walter Scott, the same care and attention to detail goes into the Walter Scott Willamette Valley appellation wines as for the single vineyard selections. The winery’s La Combe Verte Willamette Valley Pinot Noir and Chardonnay represent outstanding quality at reasonable prices and these wines typically sell out a few days after release.